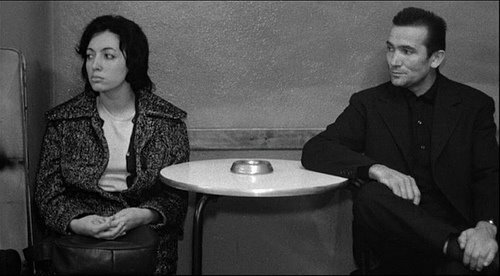 It comes and goes within a short 77 minutes, and during that time hardly anything dramatic really seems to happen, so why is Ermanno Olmi’s 1963 film I Fidanzati so dearly cherished by those who have seen it? The answer, at least in part, is how it presents the complexities of life, particularly twentieth century life, and the conflict between how people deal with these whilst striving both to maintain a sense of one’s own identity and to keep those that we love close to us. The background to this, and many another Italian film from this period, is the country’s “miracolo economico” of the 1950s and early 1960s, where a series of agrarian and fiscal reforms led to unprecedented economic growth and industrial expansion, coupled with mass population transfer from the poorer South to the more prosperous North of the country. Filmmakers at this time, particularly Antonioni, sought to try to illustrate the effects that these ongoing demographic shifts were having on individuals and the way that they interacted with each other, usually showing how society was becoming more fractured, and people more isolated in these quasi-dystopian urban landscapes. Olmi’s film, though, is a little different, and it pays to talk a little about his background. Unlike his contemporaries Rossellini, Antonioni and particularly Visconti, Ermanno Olmi was not from well-to-do stock, nor had any formal filmmaking training. Instead, he learned his craft making documentaries for the Edison-Volta electrical plant that he worked at as a clerk, culminating in his first feature-length film Il Tempo Si E Fermato [Time Stood Still] (1959). His experience of blue-collar work would undoubtedly give him a different take on the industrialization of Italy, say, relative to the more purely intellectual standpoint of an Antonioni or a Pasolini. If his second film, Il Posto (1961), was somewhat autobiographical in nature, reflecting his own transition from small town comfort to the hustle and bustle of Milan, then there is a little of himself also in Giovanni, the main character in I Fidanzati, again a Milanese but this time older and facing a year-and-a-half-long displacement to Sicily for a work contract, taking him away from his fiancé Liliana, with whom relations seem strained enough already. As the film opens, our couple are at a public dance, he trying to rationalise his move to her, she pessimistic about what it will do to their relationship. The film’s pacing is rather skewed – the opening dance is intercut with other scenes seemingly from different timeframes, non-linearity clearly influenced by Alain Resnais’ Hiroshima mon Amour (1959). European audiences at the time would have been sure to expect a similarly bleak outcome in Olmi’s film, perhaps also remembering the less-than-happy endings of L’Avventura (1961) La Notte (1961) and L’Eclisse (1962). But after the opening act, the majority of the film is devoted to Giovanni and his slow adjusting to life in Sicily, more in terms of being away from home than being away from Liliana, and it almost plays like a Werner Herzog-like discovery of a new land and peoples. It is only near the very end do we get the expected rush of pathos and emotion that we have been waiting for. Amidst the story gradually unfolding we glimpse Olmi the documentarist peeping out, his camera catching the small details of everyday Sicilian life, like an over-zealous tourist: the huge white mounds of the salt mines, a small boy in a cafe hurriedly making coffee so he can run off to play with his friends, a masked New Year party where the women wear masks presumably to protect their honour, the final shots of heavy rains sweeping across the plains. It is not just these snapshots he captures, there are also some lovingly shot scenes of industrial work, sparks from welding irons cascading down scaffolding like flourescent waterfalls. Yes – cinematic romanticised welding. As both Giovanni’s exile and his separation from Liliana wear on, the film once again shifts to non-linearity, as a series of postcards hesitantly exchanged between the couple elicits more snapshot details about their past together, but also begin to make the couple begin to envisage a future time where they are together. This temporal shift into a future not yet happened, whilst not completely out of step with the changing timeframes of the early part of the film, do mark an important turn in events, as we can see that the couple are now at least optimistic about their future, and that there is hope for them where there seemed little. It is such a seemingly simple cinematic device used, but like much of the rest of the film it is its very simplicity that makes it resonate emotionally. The influence of Italian neorealism hangs large over Olmi’s work, and no more so here: the subject matter is focused on the lives of working people, filming done in genuine locations as opposed to studio sets, a documentary-like shooting style, and most importantly the use of non-professional actors. One of the major triumphs of I Fidanzati is the naturalistic performances of the two main characters: firstly, the quiet reserve of Carlo Cabrini as Giovanni, looking much like one the passively observant leads in a Wim Wenders film, always aimlessly wandering and wondering in his newly found surrounds. Just as importantly, the wonderfully Anna Canzi as Liliana, whose silent face conveys the depth of emotion that dialogue seldom can. One scene in particular stands out to me, where she has returned to the dancehall where she met Giovanni for a New Year celebration, but sits alone in the corner, unable to join in the festivities. We see her only briefly, yet in that time her solemn expression and slouched posture are enough for any viewer to relate exactly to her postition, clearly somewhere where she wished not to be at all. I introduced the film by questioning why I Fidanzati is so beloved, yet it feels entirely inadequate merely to sketch out these details and expect to communicate its simple power to someone who has not actually seen the film. This is a film for everyone in love, or who has ever loved: warm, a little sad, tender, humane, cautious but quietly optimistic.